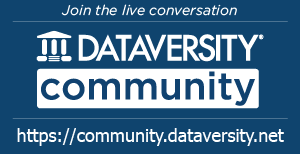 This is my 4th article on crime in Chicago for DATAVERSITY. 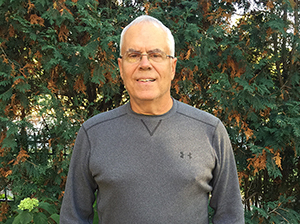 A combination of several factors piqued my interest in Chicago crime two years ago. First was the availability of detailed crime data from the city. Until two weeks ago, the data were posted daily a week in arrears. Now it appears that updates will be generated perhaps just once a week. For a few days, I was worried they might not be available at all. Second was the staggering jump in homicides from 496 in 2015 to 782 in 2016 — a disturbing 58% increase. Third was the political spectacle of the problem, especially the unhelpful weigh-ins from the potus. And fourth is my love for an adopted home. Chicago is indeed violent, with more annual homicides than any other city — including New York and Los Angeles, both considerably larger. But many other cities have murder rates (homicides/100,000 population) considerably higher than Chicago’s. St. Louis, Detroit, and Baltimore, for example, had rates in excess of 40 in 2018, compared to Chicago’s 21. Also, even as Chicago’s current violent crime activity is unacceptable, it’s important to understand the bigger picture decline over the last 20 years from the 80s and 90s, as is demonstrated in the final visual. 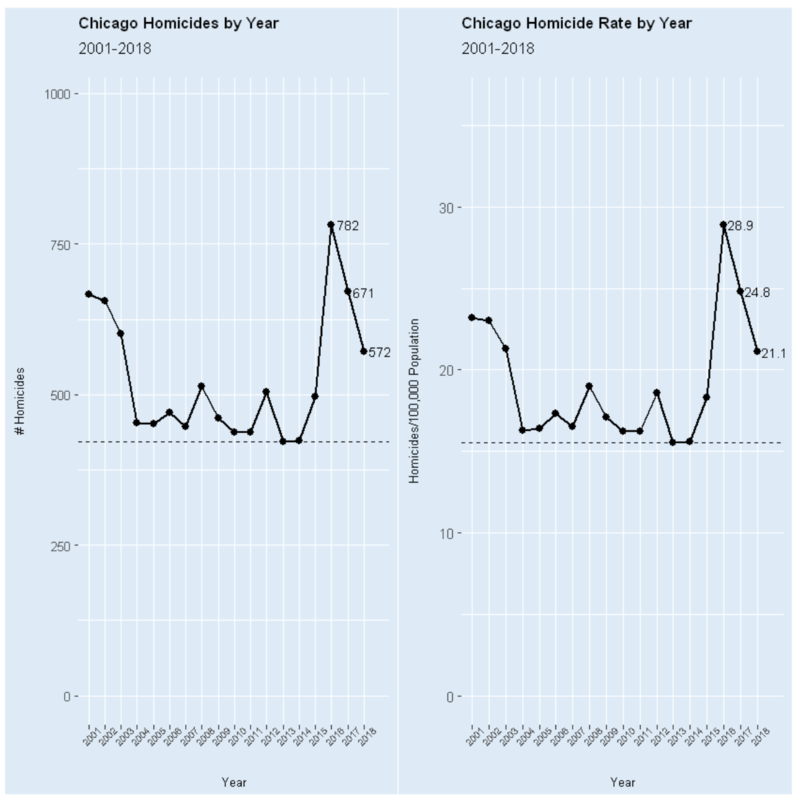 The remainder of this blog focuses first on homicide and violent crime data in 2001-2018 from the city of Chicago. 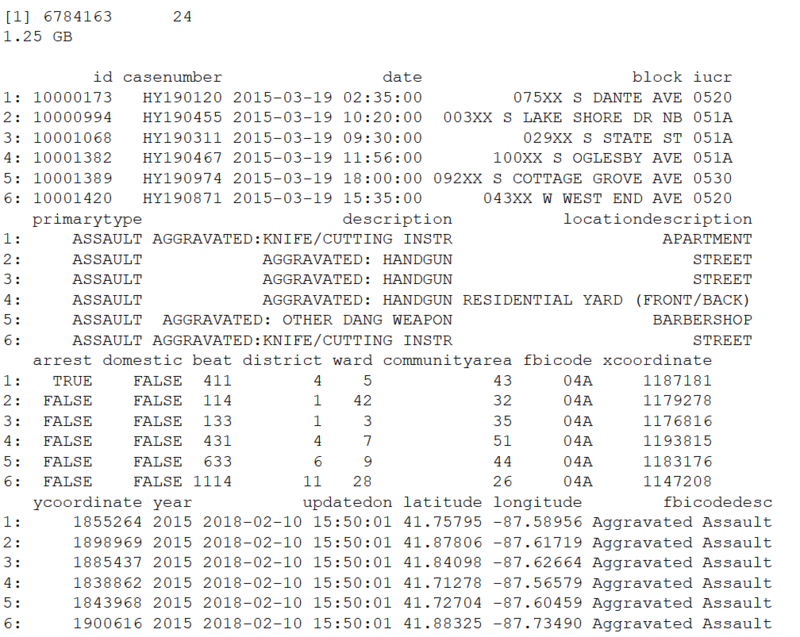 Those data are assembled/wrangled from the 6.78M reported crime records (detailed in an earlier blog), and then aggregated/analyzed using my trusty frequencies procedure. 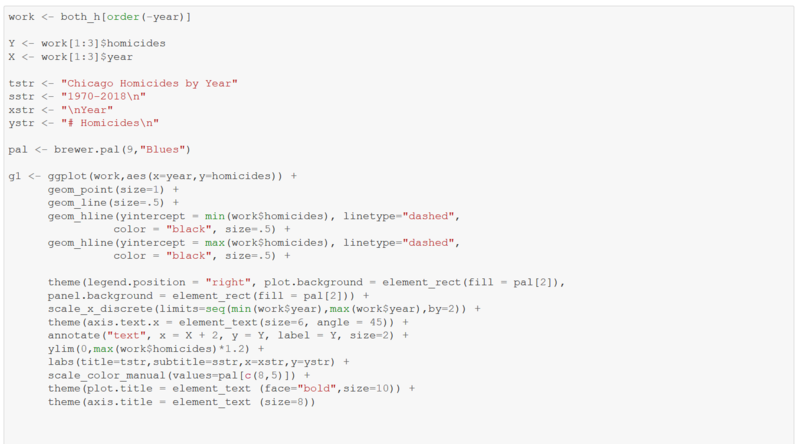 The homicide data are augmented by a data set from the Chicago Tribune, which tracks city population and murder counts over 50 years. Final outputs detailed below are visualizations generated from the frequencies. 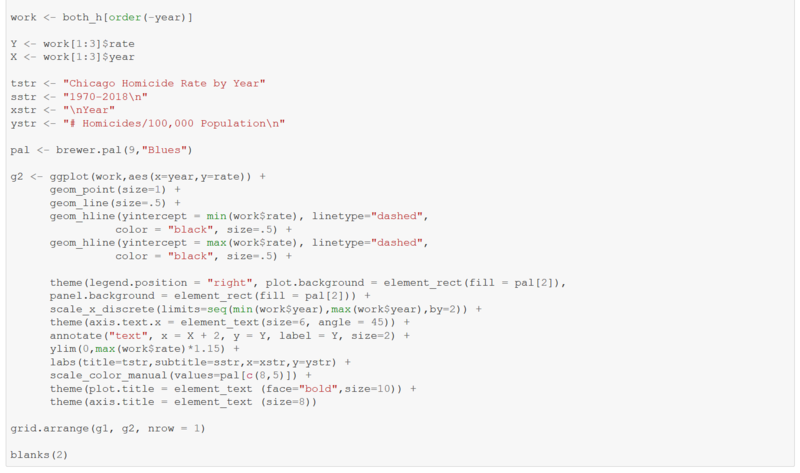 The technology used is Jupyter Notebook and R. The R data.table package and tidyverse environment drive the analyses. 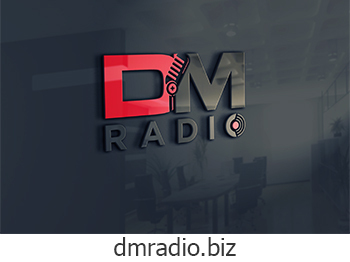 Set options, load packages and migrate to the working directory. 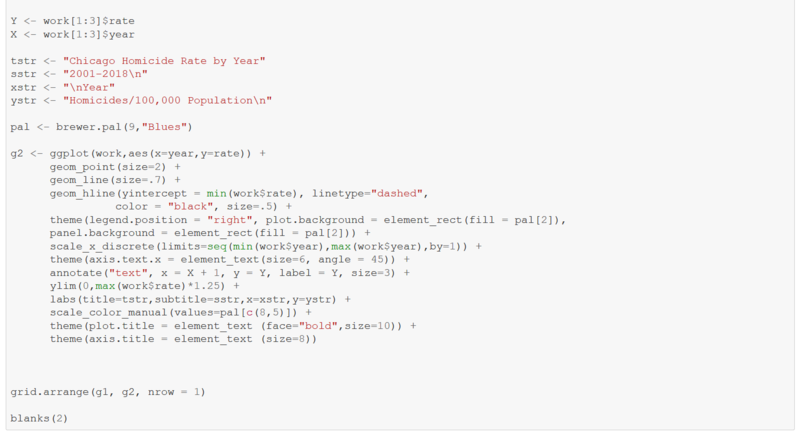 Define three generic functions — one to print blanks, one to describe a data.table, and a third to tally frequencies of data.table attributes. 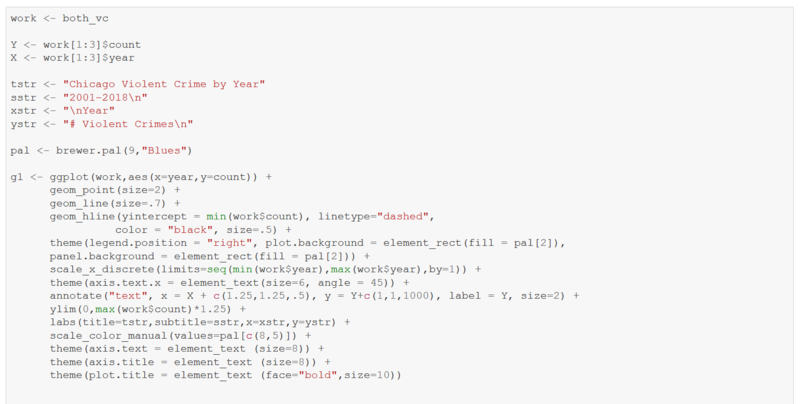 Read the already-processed, current data from a compressed fst package file. 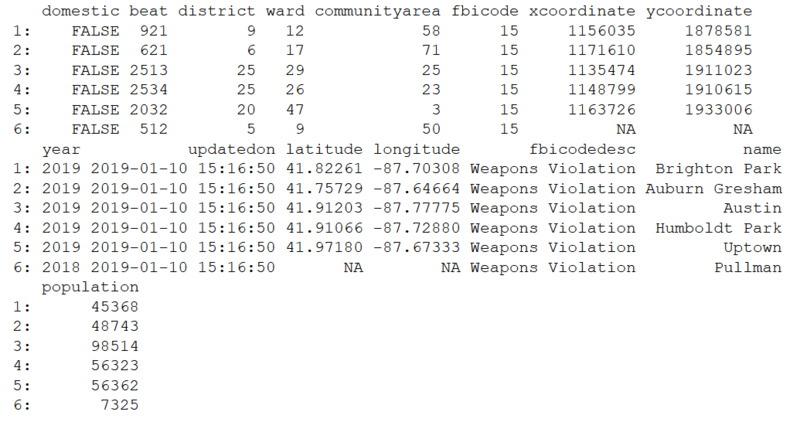 The resulting data.table is keyed on fbicodedesc. Define for subsequent filtering crime groupings of fbicode/fbicodedesc as articulated by the FBI. 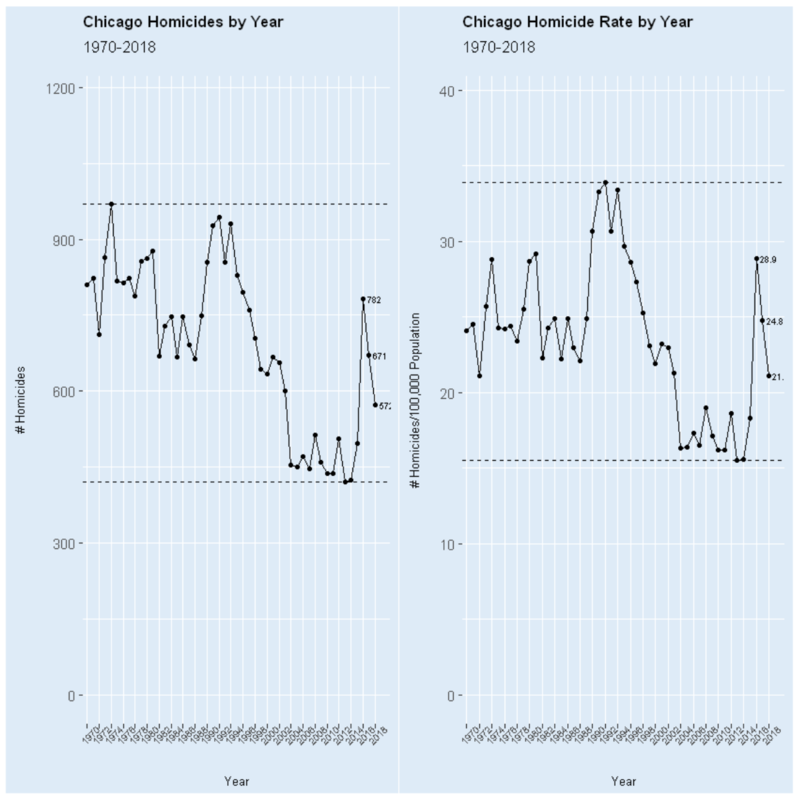 Compute frequencies of homicide in Chicago for each year of the data, excluding 2019. 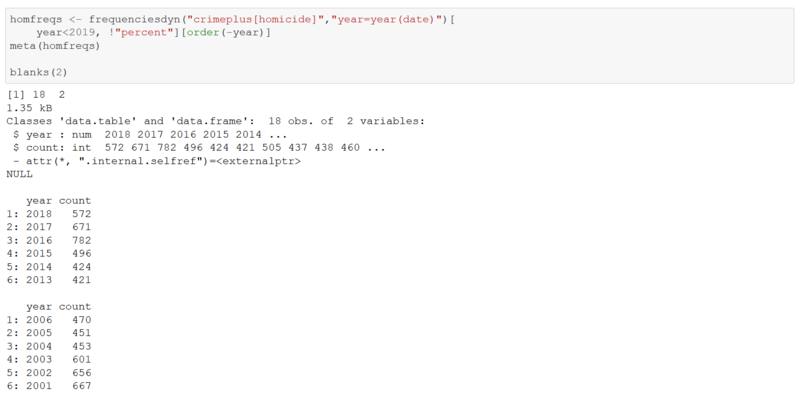 Read an auxiliary file detailing homicides by year downloaded from the Chicago Tribune. 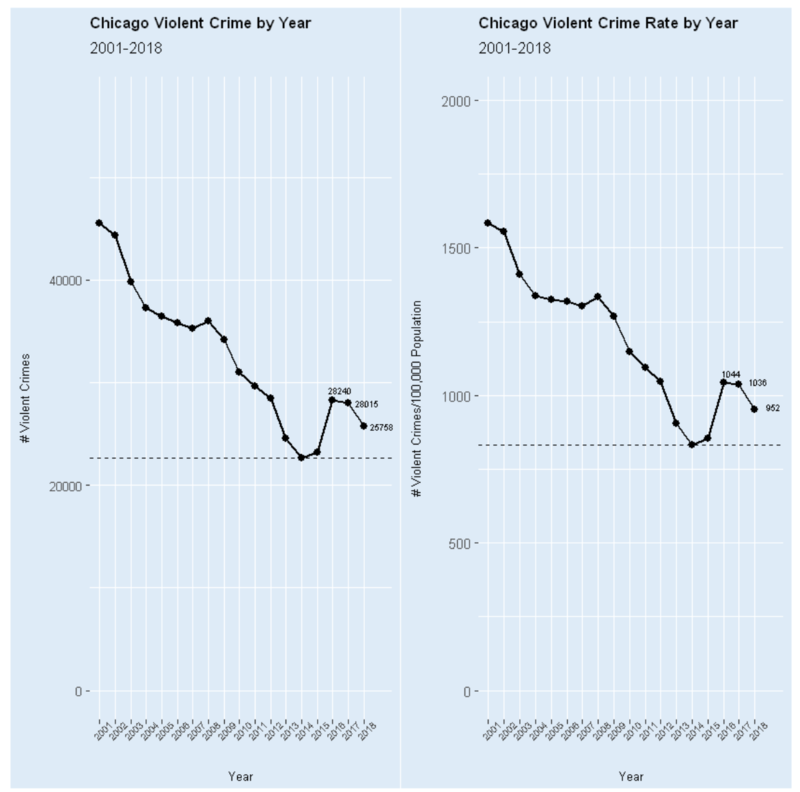 Whereas the crime data is limited to 2001-2018, the Tribune data goes back to the ’60s. 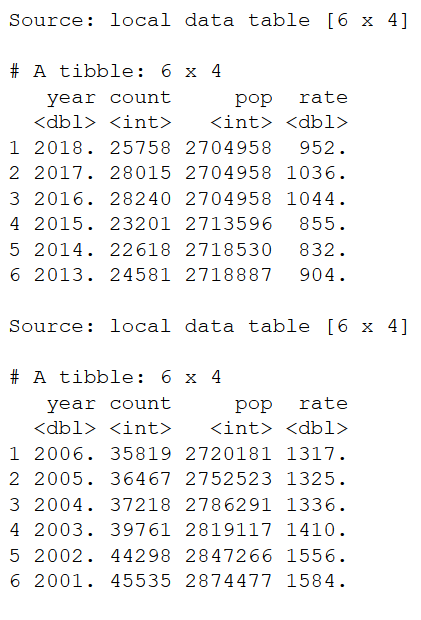 Join this table to homfreqs above, with starting point 1970. Examine Chicago homicides by year from 2001-2018. The graph on the left represents raw counts; the one on the right homicide frequencies per 100,000 population. The disturbing jump in homicides from 2015-2016 is readily apparent. Even with homicide decreases of 100/year for the last two years, the 2018 murder total is still more than 75 higher than 2015. Now do the similar computations/visualizations for violent crime. First, tally frequencies by year. 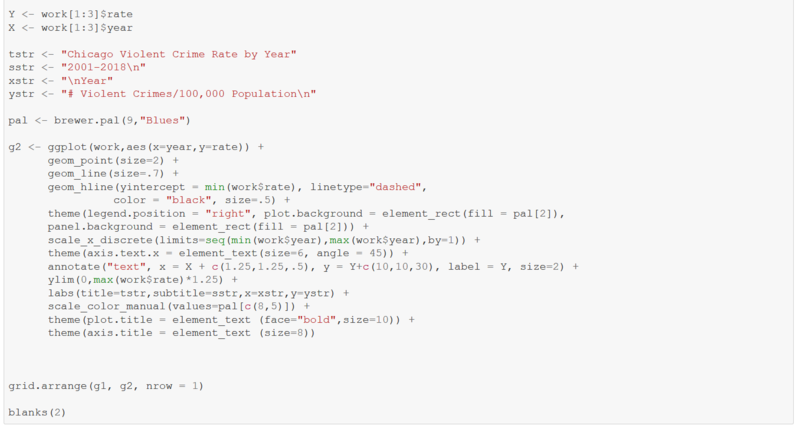 Then, embellish with the Tribune data. Visualize Chicago violent crime by year from 2001-2018. As above, the graph on the left represents counts; the one on the right violent crime frequencies per 100,000 population. Overall, a significant decline from the early 2000’s in violent crime. 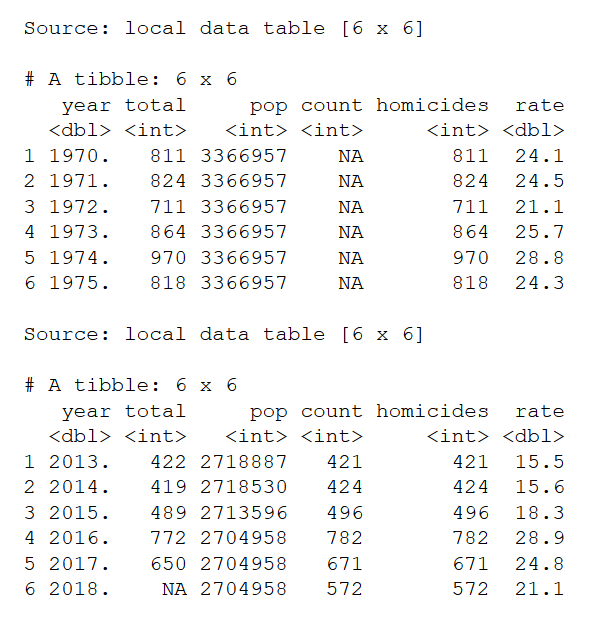 Finally, use the homicide frequencies counts in addition to the longer duration Tribune data to view Chicago murder counts/rates from 1970-2018. There are less homicides in Chicago now than 40 years ago, in large part due to a declining city population. In 1970, the population of Chicago was 3.37M; in 2018, the figure was 2.7M. Notice that the 11 lowest annual murder rates were continuous in the early 2000s. Chicago has made steady progress with violent crime over the last 19 years, and the decline in homicides in 2017-2018 is a welcome response to the catastrophic 2016. Still, there’s a long way to go and it’ll be a challenge for 2019 to noticeably improve over 2018. 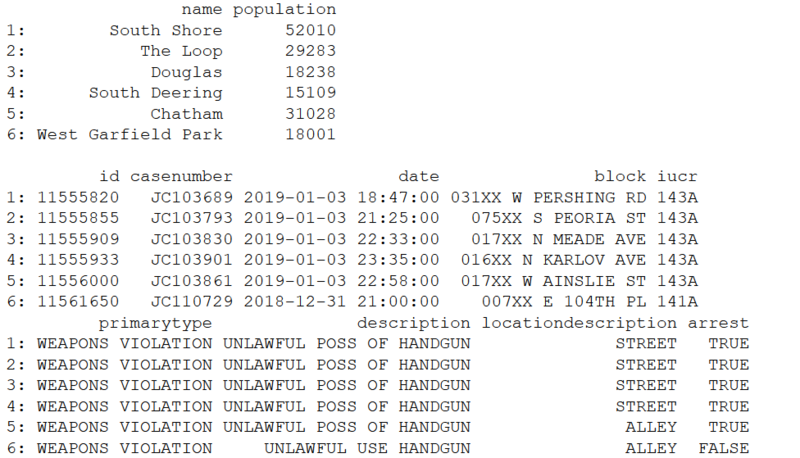 While long-term, I think the annual murder rate in Chicago can be 10/100,000 population or less, I’d consider 2019 to be successful if the number of homicides declined to 500, and murder rate was less than 20. I can see hope for the city going forward.